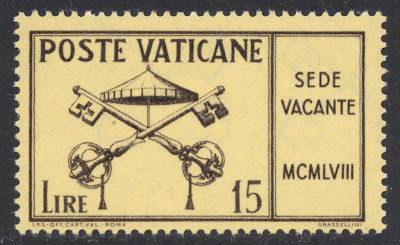 And so the dust has settled, the white smoke has vanished into thin air and a new pope has been elected, bringing an end to another Sede Vacante (Vacant See) period in Vatican City. The circumstances leading up to these events were highly unusual, what with the pope abdicating rather than dying, and this may well have led to the customary Sede Vacante stamps being extra popular. 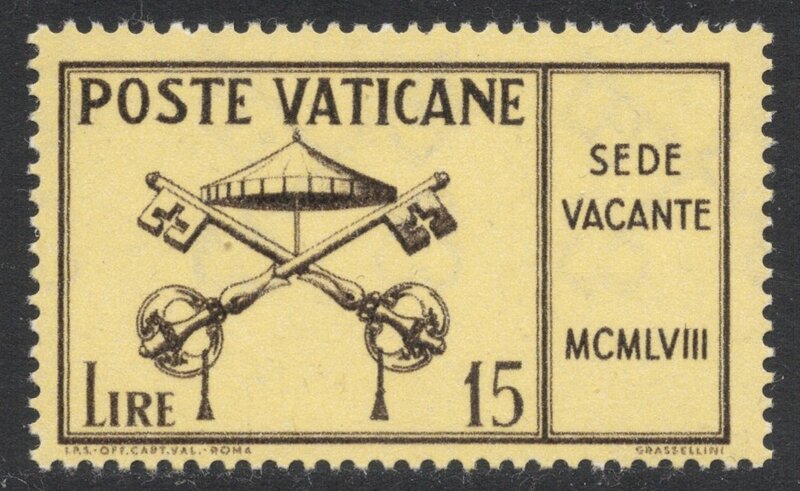 These stamps, however, have been in use ever since Vatican City started issuing its own stamps, in 1929. At the time, Pius XI was pope. He died in 1939, giving rise to the first ever Sede Vacante stamps. Not much of an effort was made, with just a simple overprint on some of the existing definitives. The set does highlight one of the traditions linked to this period, that being a change in the Holy See’s Coat of Arms. 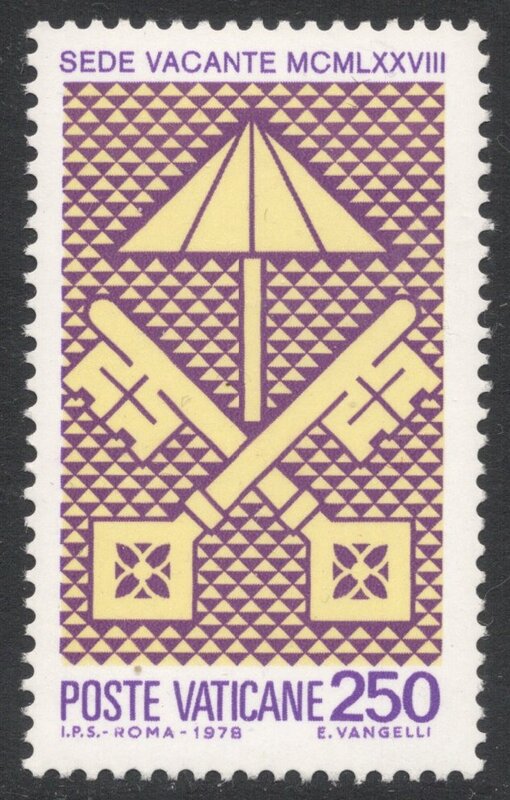 Normally, the Coat of Arms includes a papal tiara, but when there is no pope, this is replaced with a so-called umbraculum, or umbrella. The keys, as they are St Peter’s Keys to Heaven, do remain in place. 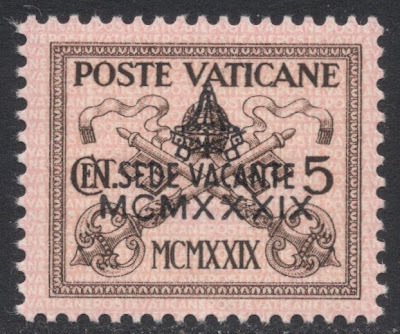 In 1939, Pius XII became pope, and he lasted until 1958. 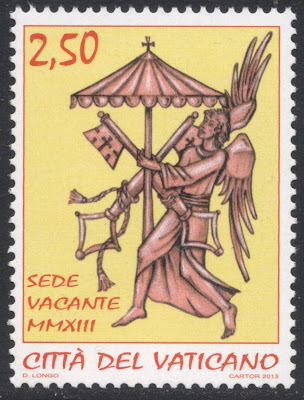 The Sede Vacante set of that year was the first to be properly designed as such. It was still a rather plain affair, with just the Arms and some explanatory text included. 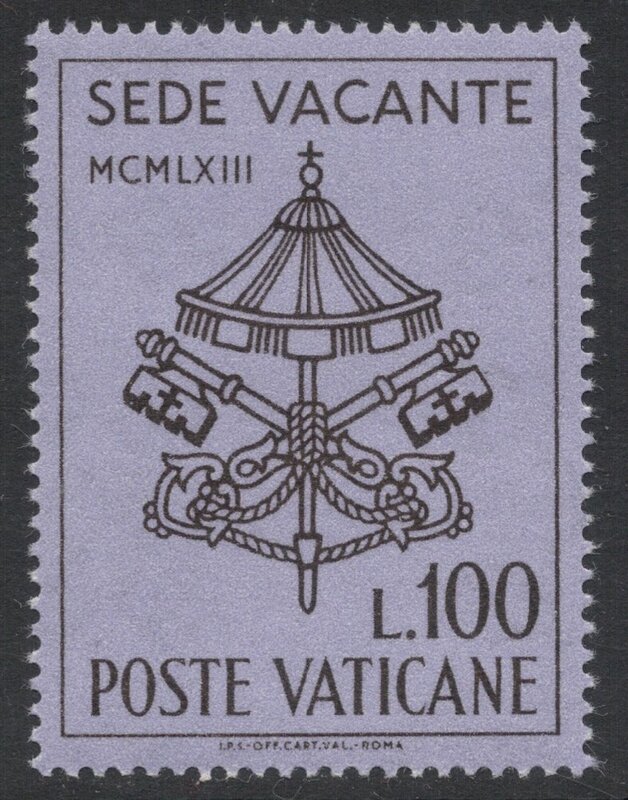 The next pope, John XIII, died in 1963, and the Sede Vacante stamps following his death were just as plain as their 1958 predecessors. Things finally started to brighten up a bit in 1978, when there were not one but two popeless periods. Pope Paul VI died in August 1978. 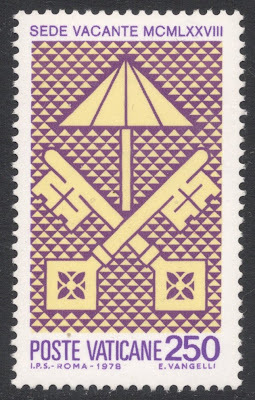 The Sede Vacante stamps show a stylised depiction of the Arms. 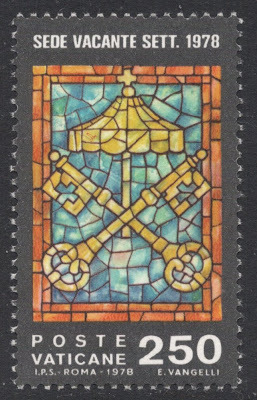 It’s quite a remarkable design, especially in view of the remainder of the Vatican stamp catalogue, which is highly traditional as far as designs is concerned. 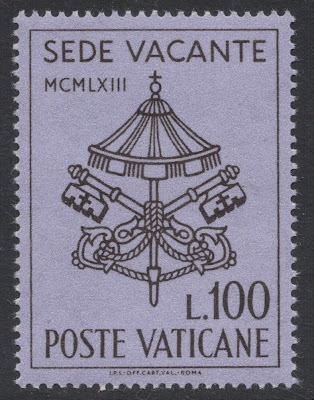 His successor, John Paul I, only lasted a couple of weeks, giving rise to the need for yet another Sede Vacante set. This time, the Arms are depicted as some sort of mosaic or stained glass, take your pick. Though only issued in October, the pope had died in September. 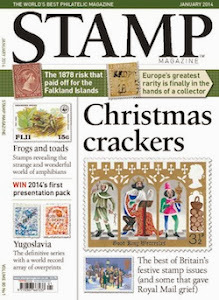 Unprepared for this, there were no stamps ready yet so it took a while for them to be issued. Hence the inclusion of Sett, being short for September. The next pope, John Paul II, lasted quite a bit longer, until 2005 to be precise. 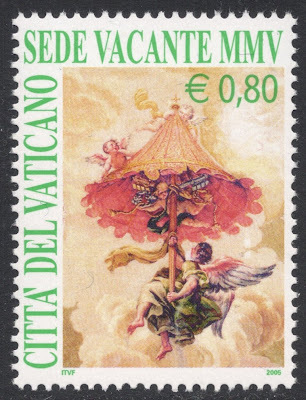 The Sede Vacante stamps following his death still depict the Arms, but it’s a much more romantic design, with an angel taking the Arms up to Heaven, surrounded by chubby cherubs. This is actually an 18th century fresco by Carlo Malli. 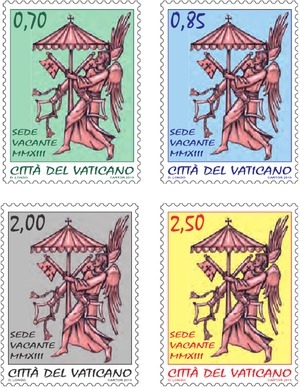 And so we end up at the Sede Vacante stamps which were issued this month. The idea of the angel lifting up the Arms has been retained, but this time we have a purpose-made design, by Daniela Longo. Though probably extra popular at the moment seeing they are linked to the first papal abdication since time immemorial, it remains to be seen whether they can hang on to their popularity or will just become one in a row of many!